As I have said in previous posts, I'm a sucker for looking cute while I work out. And I also understand that workout clothes can be outrageously expensive. Which is amazing since sometimes, there is barely anything to them. But I LOVE Lululemon. Their workout clothes are functional as they are cute. It's like they are designed by clothes designers. 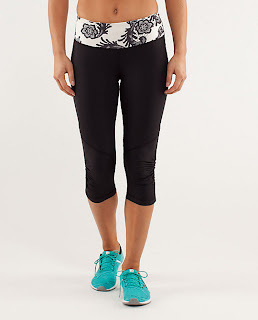 They have cute patterns and textures that get away from the plain old drab of block workout pants and a plain tank. The material they use for their clothes is light, soft and comfortable, while being supportive where they need to be, if you know that I mean :). This little beauty is designed with the coverage that most ladies want and need, while having a loose fit, with great support. It allows you to breath and the material is designed to get sweat away from you body. Love it! These are great for any way you workout, from yoga to long distance running. Great for Crossfit too! The Material is designed to keep you dry, while staying snug to your body. Not sure if you've experienced having to pull your pants while running, but let me tell you first hand, it's annoying. They have a great men's collection, so we are not leaving the guys out.